Phalut is one of the highest peaks of Singalila range and located in Darjeeling district at an altitude of 11,811 ft. This is the second highest point in Singalila ridge after Sandakphu (11,929 ft). Phalut is also in the border of Nepal, Sikkim and West Bengal. After a trek to Sandakphu, many plan for an onward trek up to Phalut before commencing the return. Phalut is further 21kms from Sandakphu. Manebhanjan is the base of Singalila range where the trek actually begins for Sandakphu and then onward to Phalut. The distance of Phalut from Manebhanjan is 53kms. Depending on the ground one can cover, it takes 3 to 4 days to reach Phalut from Manebhanjan. There are both GTA (Gorkhaland Territorial Administration, erstwhile DGHC) lodges and private trekkers huts on the way for night stays. The word Phalut which is derived from the Lepcha word Fak-Luk, means "Barren Peak". The area and even the last stretch to Phalut is actually quite barren. This is quite a contrast to the dense forests that are so common at the lower levels. But from Sandakphu for a long way you will pass through unabated beauty of the nature before you reach Phalut. On the way there are rhododendron trees of various types that bloom with colorful flowers during April to May. You will also pass through forests of oaks, chestnut trees, magnolias and silver firs. This is typically the Day-4 trek when you are trekking via Sandakphu. As you start your trek from Sandakphu towards Phalut, you will shortly see the majestic Kanchenjunga family of peaks right ahead. Look towards the left and you will see the dazzling Everest family including Mt. Everest, Lhotse and Makalu. The route from Sandakphu to Phalut has a relatively easier gradient as both the places are at similar altitudes, however there will be inclines to climb at some places. 14kms from Sandakphu, you will reach a tiny village called Sabargram (also known as Sabarkum) at an altitude of 11,624ft. From Sandakphu and all the way for 14kms up to Sabargram the view is simply awesome. You will keep seeing Kanchenjunga on your right and Everest family on the left as you walk through lovely meadows and forests of rhododendrons. Sabargram itself is a beautiful place with open grassy land with rhododendron plants, firs and scattered bushes. There is a forest hut at Sabargram where you can plan to stay for the night depending on availability. This hut belongs to the forest department. This is where several trekkers halt before starting their journey early next morning. Many trekkers also camp at Sabargram. You need to carry your own food although the caretaker at the hut can also sometimes arrange for food. Another option for night stay is at a place called Molley which is further 2kms away. The wonderful hut at Molley is located in the forest and has several rooms. However, experienced trekkers cover the entire 21kms stretch between Sandakphu and Phalut on a single day. From Sandakphu, it takes about 5 hours to reach Sabargram. The place is marked by a roofless stone house on top of a hill. From Sabargram, keep moving along the trail northwards (after Sabargram the trail forks, take the left). Phalut is another 7kms away and should take another 2.5 hours to reach. After a while the route becomes a zigzag trail that starts climbing up towards Phalut. You will pass by the Trekkers Hut on the way. From here, the peak of Phalut is another 25 minutes or so. The last stretch of 1km to Phalut is a steep climb. Note: You should carry water and food from Sandakphu as you trek to Phalut. There is no water supply in between and hardly any place to eat. Once you reach Phalut summit, you are in a small flat grassy land which is devoid of any vegetation. There is an Indian Army bunker house near the peak of Phalut. However if you look around, you will be rewarded with awesome view of a long stretch of snow peaks. The range includes some of the highest peaks of the world including the Everest group, Kanchejunga, Chamolhari, Pandim, Three Sisters and lot others. The snow range stretches from Nepal on the west through Sikkim, Bhutan and up to Arunachal Pradesh in the east along a distance of about 320kms. From Phalut you will feel Kanchenjunga is literally at a stones throw distance, although it's about 48kms along a straight line, but appears gigantic and awesome. Actually this is the closest view of Kanchenjunga that you get in the whole of Singalila range. There is a GTA (Gorkhaland Territorial Administration) Trekkers hut in Phalut. You can book by visiting one of the GTA tourism offices (see Tourist Information Centers). The Singalilla Pass is about 17kms from here. Phalut is also part of Singalila National Park. The native tribes who live in the area, consider Phalut's peak to be the god who knows about everything and call it "Omna Re Ay". Update October 2011: Land Rovers and Jeeps from Maneybhanjang are plying all the way up to Phalut (via Sandakphu). On your return from Phalut, while you can always retrace the same path back through Sandakphu, Tonglu, Meghma etc, there are couple of other better options for returning to Manebhanjan and then back to Darjeeling or Siliguri. The most popular return trek route from Phalut is via Gorkey, Rammam, Srikhola and Rimbik. First check out the Sandakphu & Singalila Route Map for a visual understanding of this return route and get back to this page. This is typically the Day-5 trek of the Sandakphu/Phalut trek circuit. From Phalut, take the bridle path through the forest area towards Rammam. The trail from Phalut up to Gorkey is about 15kms and quickly descends through forests of bamboo, pine, chestnuts, hemlock etc. You will also find plenty of Rhododendrons and oaks. You can also take several shortcuts by crossing some water channels along the way. After a while you will see the Rammam river on your left which forms the border with Sikkim and then you will see below the amazing meadow of Samandeen which is popularly known as the second Switzerland. The 15kms stretch takes about 5 hours. Note that at some places the downhill trail is quite steep and could be slippery. So be prepared to take a lot of stress on your knees and calf muscles. The village Gorkhey is surrounded by pines. A mountain stream called Gorkey Khola flows in a picturesque setting. This stream is a tributary of the Rammam river. Many trekkers halt here for a while, take a bath in the river, enjoy the lovely views around the scenic village Gorkey before marching forward. There are some 30 odd families that live in this village and offer their huts for night stays. Shanti Lodge and Eden Lodge offer basic accommodations here. No need to book these accommodations in advance. There is also a GTA Lodge in Gorkhey. Many trekkers prefer to stay at Gorkhey overnight just to enjoy the sheer scenic beauty and serenity of the place. If you are staying here overnight, take a walk along the river bank in the afternoon, come back and relish some local rice beer. Otherwise trek along an uphill route and you will reach the small village Samandeen which you earlier saw from a higher altitude. This forest village located on a scenic plateau is also known as Lost Valley. Many would claim that Samandeen is arguably the most picturesque spots in the whole of Singalila trek... and I would certainly agree. There is no GTA trekkers lodge at Samandeen. But there are a few basic homestays here run by the villagers as extension of their own houses. The locals are simple, friendly and generous. 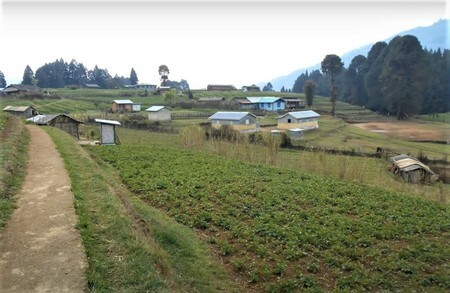 The route from Samandeen descends initially up to a stream and then goes uphill to reach the Rammam village (8,400 ft). Most of the trekkers take a night halt at Rammam. Gorkhey up to Rammam is about 9kms and takes about 3 hours of trek. So from Phalut to Rammam is about 24kms (about 8 hours of trek). There is a trekkers hut in Rammam which is run by a local family. Hotel Sherpa located in the village also offers accommodations at reasonable rates. Noodles and tea are always available for light refreshment and so is rice beer (if you like to indulge a bit). The Rammam Higher Secondary School is set up in a picturesque place, on a ridge and facing the mountains of Sikkim. There is also a monastery in Rammam which is run by the family who owns the trekkers hut. This is typically the Day-6 trek of the Sandakphu/Phalut trek circuit. From Rammam, start early next morning towards Rimbik (6,500 ft) which is 19kms away. On the way you will get a small village called Srikhola about 12kms from Rammam. The first 9kms is a level route going through forests and then it descends to Srikhola. From here, Rimbik is about 2-hrs walk. There is a trekkers hut at Srikhola and most trekkers stay here for the night so that next morning one can quickly trek down to Rimbik and catch the bus or jeep for Manebhanjan. Check out Srikhola & Onward Trek to know about the village Srikhola, the onward route to Rimbik and all other details to get back to Darjeeling or NJP/Siliguri. From Phalut, there is a second return route (although not very popular). This is typically the Day-5 trek of the Sandakphu/Phalut trek circuit. From Phalut go back to Sabargram which is 7kms on the way back to Sandakphu. From here take a left turn to the trail (next to Sabargram check post) that goes all the way to Rammam through dense forests. This route passes through dense forest of chestnuts, oaks, magnolias, rhododendrons, silver fir and hemlock. The total distance from Phalut to Rammam is about 16kms. Although this trail is shorter, the downhill muddy slopes can be dangerous and therefore should be trekked very carefully. I had once made a mistake of taking this route while it was raining. The steep downward gradient along with fallen dry leafs on the ground and rainwater made the route extremely slippery. In several occasions we skidded but somehow could manage to avoid serious injuries. 1) Sandakphu and Singalila Trek: Know all about the trek up to Sandakphu, from where you can launch your trek to Phalut. 2) Camping on Sandakphu & Singalila Route. Dear Mr. Raj, I am planning the trek in the month of April'18 with a 5 member team including 2 kids (ages 12 & 16). Our trek starts on 9th April from Manebhanjan and end on 14th at Srikhola. The route is Tumling, Kalipokhri, Sandakphu, Phalut, Samandeen, Srikhola. We are planning to stay at Samandeen instead of Rammam. Is it OK? Can we walk till Srikhola from Samandeen next day? Pls. share your valuable feedback on the trek plan. Thanks & Regards. Hello, yes you can stay at Samandeen and then trek to Srikhola next day (start early). However there are no proper accommodations in Samandeen (except for few homestays run by the villagers). If you can adjust with your family, then it's okay. Otherwise stay at Gorkhey. 1> Regarding the forest hut at Sabarkum that you mentioned, where we (a group of 3 people) want to halt for a night on our way to Phalut. How to reach this place? Please provide any contact details for pre-booking, if available. 2> How long does it take to get to Darjeeling from Phalut in a Bolero if we start early morning? Please suggest the quickest route for this. Thank you in advance. Hi, the Sabarkum (Sabargram) hut belongs to the forest department. Don't think there is any direct contact no. of the hut. Accommodation there is limited and you can stay if available. There is only one hut in Sabarkum. You can also plan to stay little further ahead at Molley... the trekkers' hut here has several rooms and is very nice. Booking is usually not required. Phalut to Manebhanjan will take about 6.5 hours by Jeep with a break in between. Manebhanjan to Darjeeling is 1 hr 15 minutes. Raj, I would first like to thank you for all the needful information you provided in your website. Please allow me to ask you few questions which are as follow: 1)Is trekking from Gorkhey to Phalut is feasible in a single day? 2)Do we need to pre-book the trekker's hut at Phalut? 3)Do we need to carry food with us while we trek to Phalut? I will be really grateful if you kindly help me out with these queries. Thank You. Hi, Phalut to Gorkhey is a 1 day trek. But the reverse could be difficult unless one is a seasoned trekker. Gradient is quite high at several places. So unless you know what you are doing and confident about it, suggest not to try unusual stuffs on this route. You will get basic veggie food at the GTA hut of Phalut, but carry some biscuits, nuts etc which are always handy. This is the only accommodation in Phalut, you should pre-book for overnight stay particularly during high trek season. Hi, I am Arif from Bangladesh and planning to visit Sandakphu-Phalut in this October. The bus from Dhaka arrives Siliguri at noon. So I would like to go to Mirik on that day and stay for one night as you have suggested in the Phalut Trek page. On the next day I will go to Manebhanjan from where would like to take a jeep to Sandakphu. Can you please suggest any good budget hotel to stay in Mirik which offers good view of the lake? Also, I would like to leave the jeep at Sandakphu and on the next day trek to Phalut. Trek to Gorkhey on the next. And finally to Srikhola on the next. Gorkhey to Srikhola is about 15Km I guess. Can you please suggest if we can trek from Gorkhey to Srikhola and then catch a bus/jeep to Darjeeling on the same day? Thanks!! For lake view at Mirik, you can stay at Hotel Park ... a budget hotel by the lake side. The Jeep leaves Srikhola by 11:30 in the morning, so you won't get it when you reach. So plan to stay overnight at Srikhola. You can stay at Hotel Shovraj (which is the best hotel there). Mention my name or website, and you can get better care & attention. By the way, Hotel Shovraj offers 20% discount on room rates, tours & treks to Darjeeling Tourism Card holders. We are a group of 6, and we are planning to go on Sandakphu Phalut trek this end of May, we have made our bookings at Trekker's Hut at Tonglu, Garibas, Sandakphu and Phalut. We are facing a problem while making our return trip from Phalut. We decided to go via Rammam, halt there for a night, and then next day move on to Rimbik, and take a jeep or bus from there to Darjeeling. But we were told that we have to make a halt at Rimbik as no transport would be available on the day we arrive. But we wanted to go back to Darjeeling. So we being a novice, if you could kindly help us in this matter, if it is possible for us to return to Darjeeling on the 2nd day itself. Thank You. Eagerly Waiting for your Reply. From Rammam, Rimbik is more than 15kms. By the time you reach Rimbik, it'll be late in the afternoon or evening. You won't find any transport at that time. Bus leaves in the morning and shared jeeps are available until about 2pm. So you should plan to stay back at Rimbik for one night. I wanted to ask if this itinerary is good or does it need modifications? Will the Trekkers' Huts need to be booked in advance (if yes, how do we go about it and how early) or can they be acquired on the spot? Also budget hotels to stay in at Darjeeling and the estimated costs. And will the time of April offer good scenic views? I'll be really grateful if you take the time to help me. Thanks a lot.